This week's card is the direct and decisive Queen of Swords. Her stellar counterpart is Libra, the seventh zodiac sign of relationships. As the meeting point between water and air, The Queen of Swords embodies the balance between the emotions and the intellect. Like the Libra scales, she weighs out both factors before making a decision because she knows each is required to keep the other in check. She applies logic with empathy, taking a tough love approach to all situations. 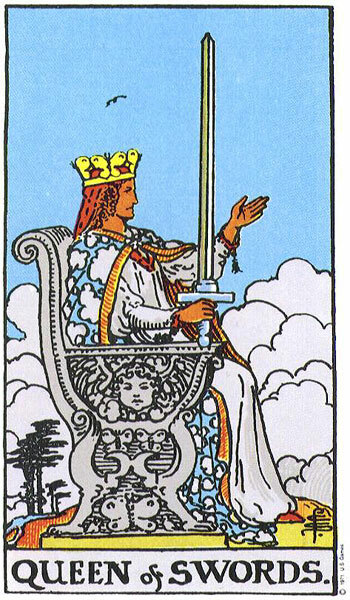 The Queen of Swords is often painted as cold (and often downright bitchy), but her association with Libra puts that to rest. Libra is ruled by Venus, the planet of love and warmth . This reminds us that the Queen of Swords is not frigid. In fact, she's a compassionate Queen with excellent people skills. Libra is the zodiac's diplomat, and Libra natives are often praised for their poise and grace. Etiquette-expert Emily Post was a Libra, as is the ever-elegant Kate Winslet. Keeping these beautiful ladies in mind, the Queen of Swords is the opposite of icy! She's the impeccable socialite, quick to charm and strike up a stimulating conversation. Channel the Queen of Swords when you need to make an excellent impression. When the Queen of Swords comes up in a reading, it could be telling you to use your intuition when it comes to reading people. Like her Major Arcana counterpart, Justice, she's a master judge of character. With Venus in the mix, her impressions on relationships are uncanny. Use this to your advantage when she comes up, and don't get caught up in the wrong crowd. Libra also rules the arts, and many Libras become poets or musicians. Though we don't often think of the Queen of Swords in relation to art, her connection with Libra reminds me of the Hindu goddess Saraswati. Saraswati is the goddess of music, sound, intellect, and flowing creativity. Her followers invoke her before taking academic tests or writing songs. Like Saraswati, you can turn to the Queen of Swords if you're seeking inspiration and a clear mind. You never know: she could be your new muse!